Pearls are iconic, classic and timeless. From a simple strand to pearls strung into various shapes, these ivory colored beads have adorned America’s first ladies for decades. Join us in exploring our favorite pearl style icons. Martha Washington, our country’s very first First Lady, had a great fondness for pearls, especially small, naturally formed seed pearls. 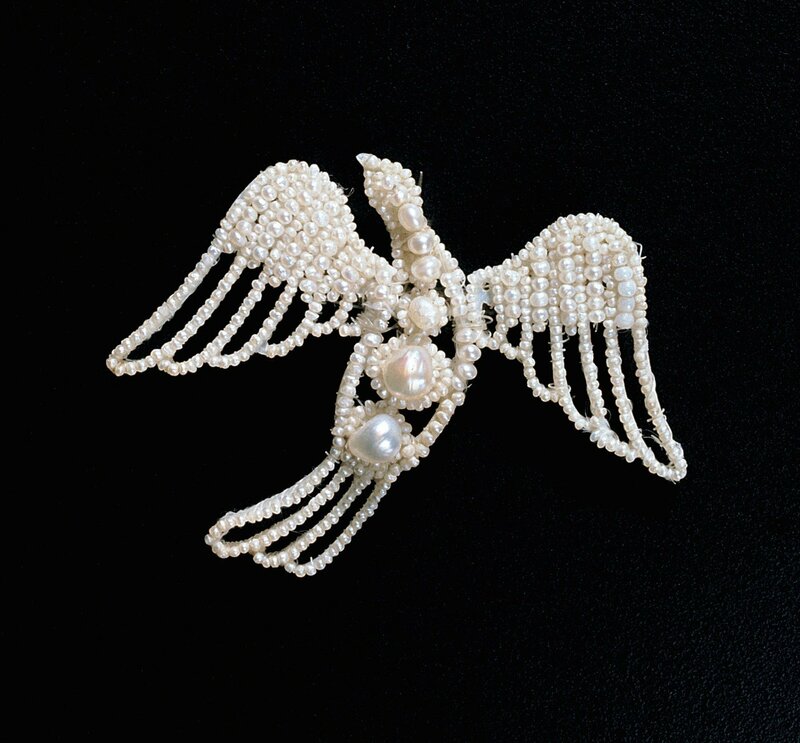 A favorite piece of her jewelry was a fantastic dove-shaped pin. Seed pearls make up the wings and body of the bird, as well as the wings’ upper half. Eight graduated pearls, each circled by tinier seed pearls, comprise the body of the dove, with the smallest pearl at the head and the biggest pearl at the tail. Martha Washington dressed simply, but elegantly. 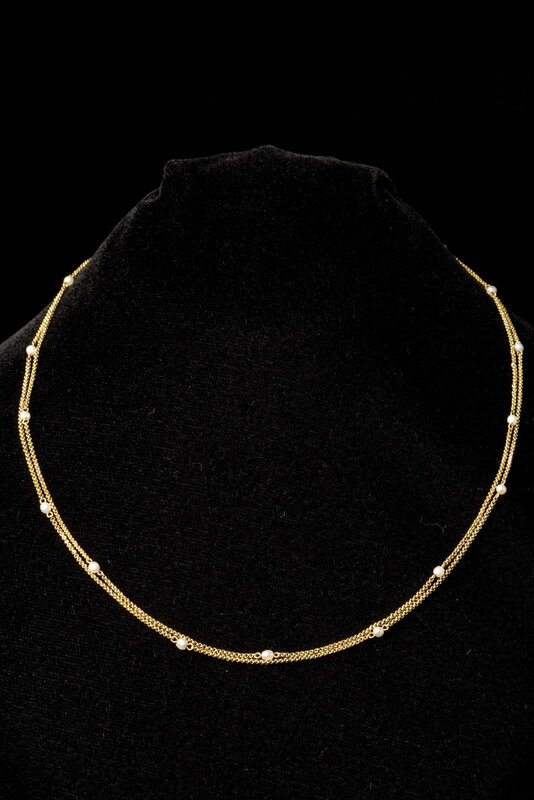 She wore this beautiful double stranded gold chain and pearl necklace around 1879. Seventeen freshwater pearls are distributed evenly over the two golden chains. Abigail Adams, wife of John Adams and mother of John Quincy Adams, was the second First Lady of the United States. She wore what were probably the most famous faux pearls of the 18th century. Glass pearls were very fashionable around the time period of 1766. 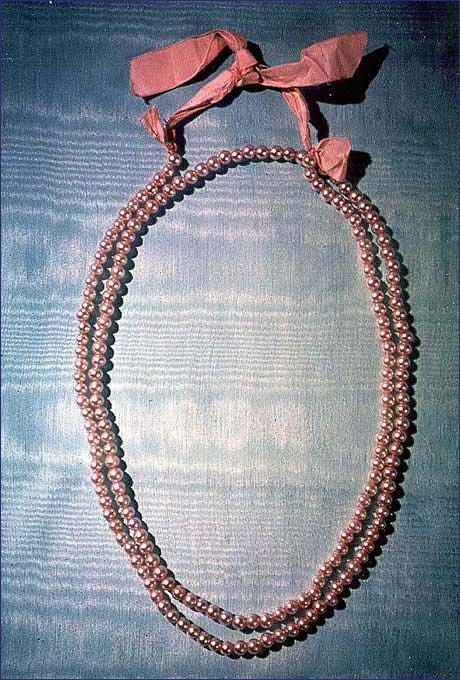 These pale pink faux pearl beads, worn by Abigail Adams, now reside in the collection of the Smithsonian Institution. Dolly Madison, the 4th First Lady of our country, was a Southern belle known for her charm and gumption. Most people remember the story of how she saved precious White House objects from ruin before the White House was burned and completely destroyed by British troops. Dolly had a fondness for pearls, as we can see by a portrait painted of her in 1817, where she’s wearing a simple strand of pearls, a lace ruffle around her neck, and diamond earrings. 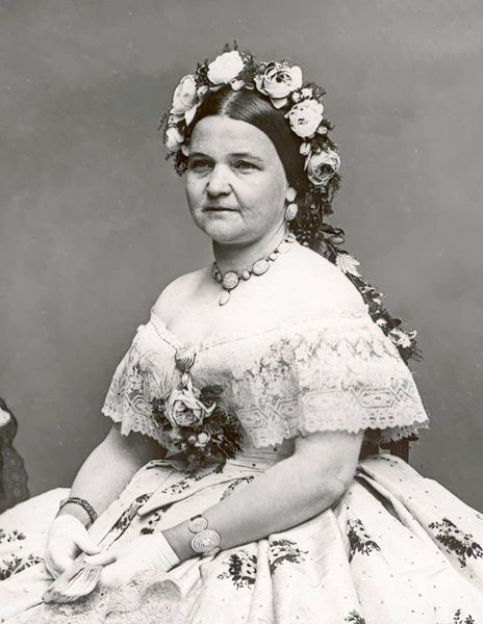 A photograph of Mary Todd Lincoln shows her wearing a fabulous seed pearl necklace with two matching bracelets at the first Lincoln Inaugural Ball. Sadly, her husband bought her this jewelry from Tiffany’s to console her after the deaths of their baby, and her half-brother. Julia Dent met her husband-to-be Ulysses S. Grant, when her brother Frederick, a classmate of Grant’s at West Point, introduced them. Julia wowed the guests at the 1869 Inaugural Ball, where she wore lace and satin, and diamonds and pearls. 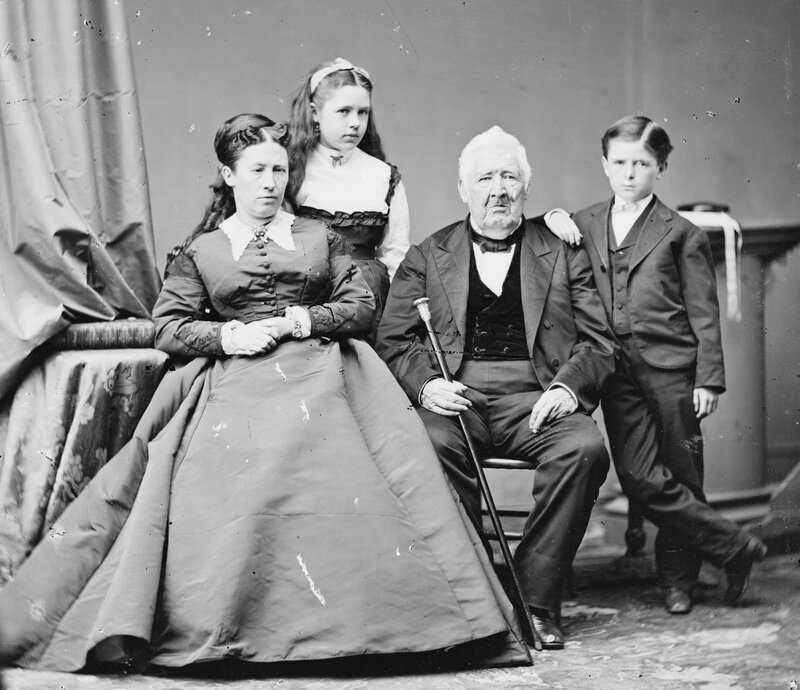 Julia Dent Grant became an overnight sensation in Washington because of her husband’s fame. She was a lavish hostess and a prominent figure at many concerts, plays, and lectures. A highlight of the Grant White House years was the 1874 marriage of their daughter. Julia presented her daughter with silk, lace, and pearls. Americans were bowled over by the beauty and poise of Grover Cleveland’s young bride (she was 21 when they married). 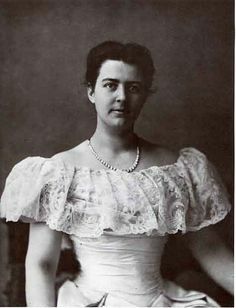 Mrs. Cleveland dressed elegantly, preferring the dresses of Maison Worth, a leading Paris design house. She offset these dresses with a beautiful single strand of pearls, and also wore dresses ornamented with sequins, tassels, and seed pearls. 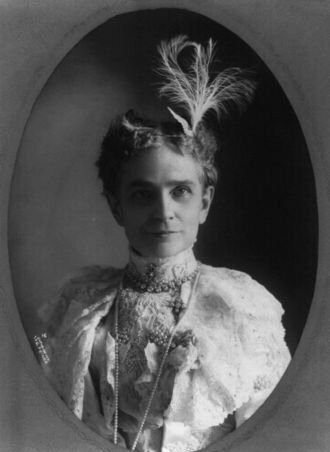 Ida McKinley first met future husband William McKinley at a summer picnic. 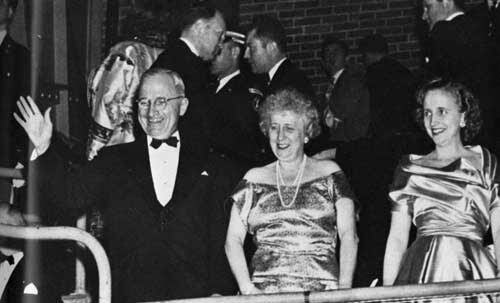 She loved beautiful clothing, exemplified by her first Inaugural Ball dress which was made of satin and intricate lace. Rhinestones and pearls were worked into the embroidery on the front panel, as well as the sleeves of this exquisite dress. 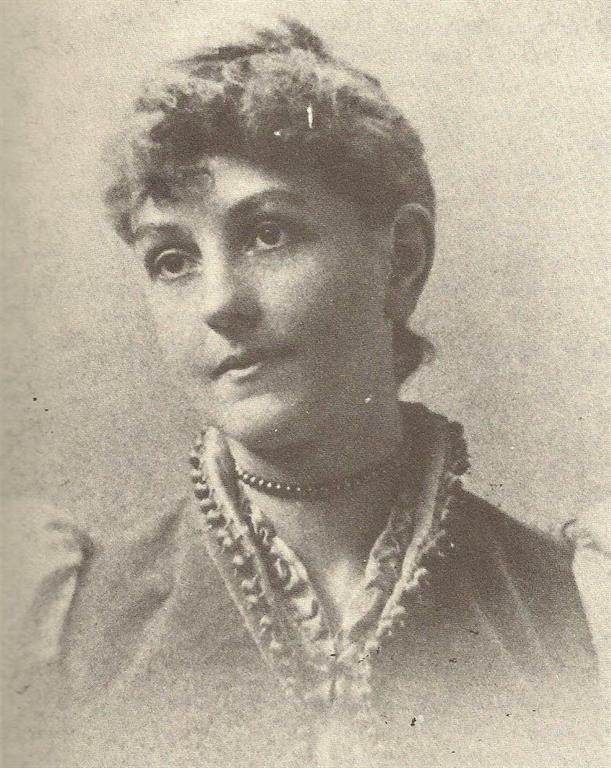 Ida McKinley had a fragile and nervous temperament, compounded by the loss of her mother and two young daughters in a short span of time, and was also affected by epilepsy. Despite these hardships, Mrs. McKinley still maintained her elegant style of dress. Here she is shown at a State dinner, wearing an elegant single strand of pearls to offset her feathered hairpiece. 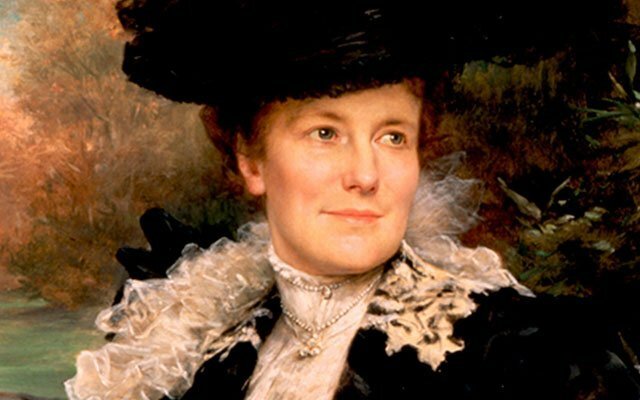 Edith Roosevelt was the 2nd wife of Theodore Roosevelt and served as this country’s first lady from 1901 to 1909. 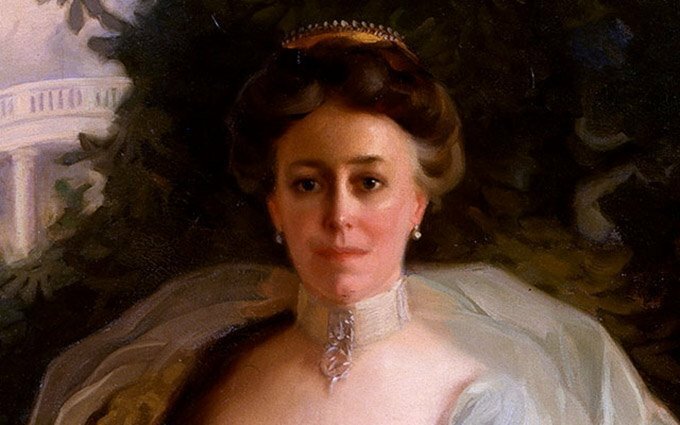 She was described as being a “gentle, high-bred hostess.” Although she is famous for owning a diamond necklace created by Harry Winston, she also loved pearls and is seen here wearing a beautiful pearl necklace in her official White House portrait. 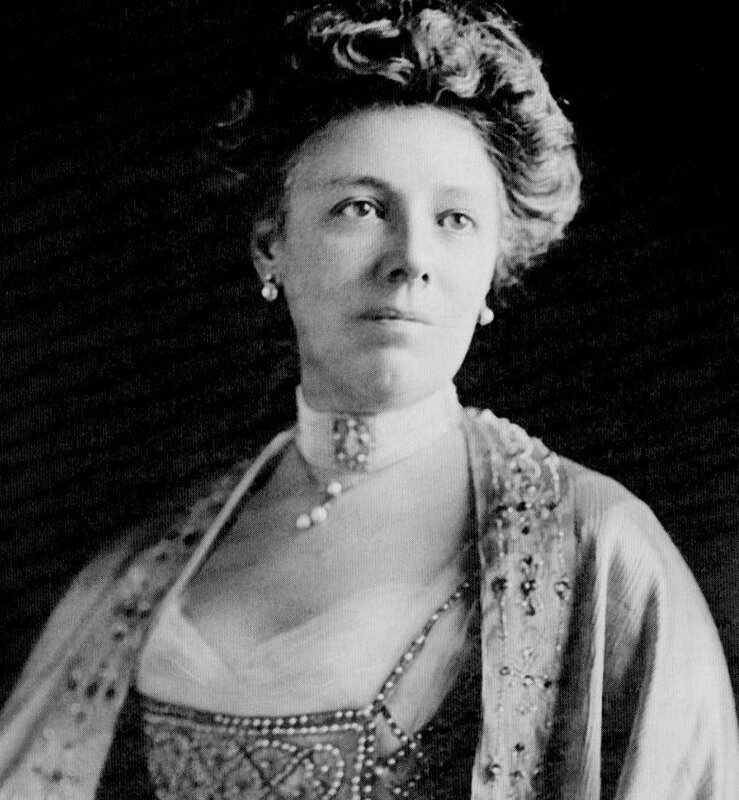 Helen Taft was known for her fabulous sense of glamor and style. In this photograph, she is shown wearing her enchanting pearl choker and drop earrings. Helen Taft met her husband to be in 1879 at a bobsledding party. 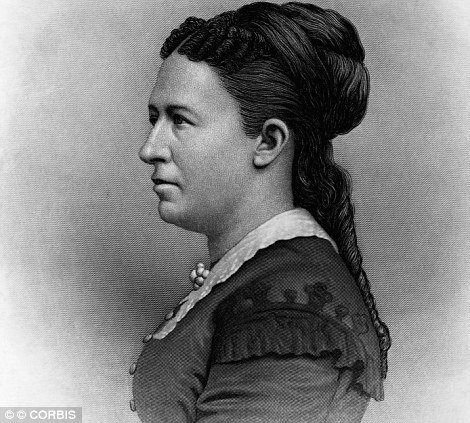 She was the 1st First Lady to ride in an inauguration parade, and she was responsible for the planting of more than 3,000 cherry trees on the Capitol Grounds and around the Tidal Basin. 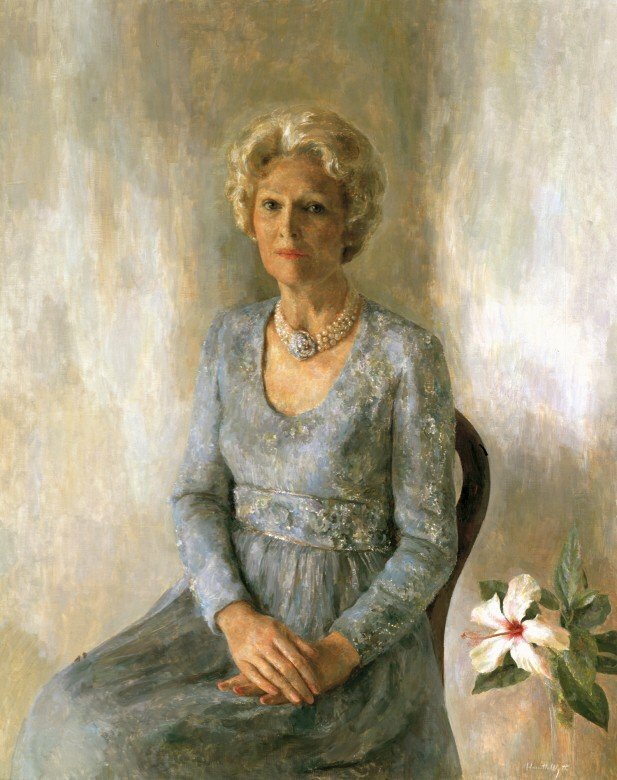 This painting shows Helen wearing her favorite piece of jewelry, a pearl choker. Ellen Axson Wilson was Woodrow Wilson’s first wife and the mother of his three daughters. She was an educated woman and an artist, and she brought an unaffected elegance to gatherings that endeared her to many. They decided to forego an Inaugural Ball in 1912. This photograph of her was taken in 1913, wearing a beautiful strand of pearls. 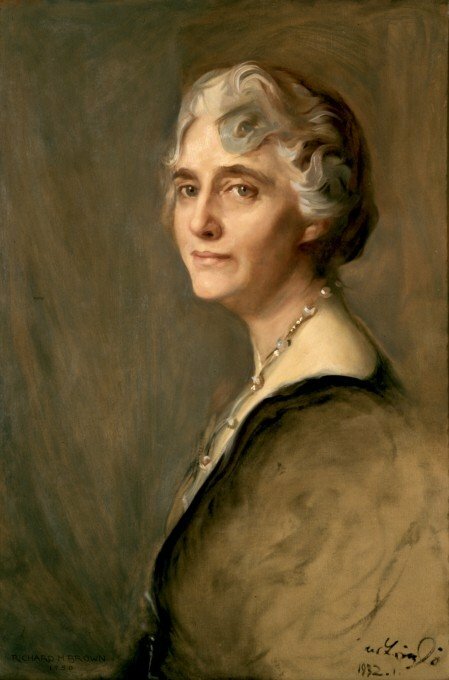 Lou Henry Hoover, the wife of Herbert Hoover, served as our country’s First Lady from 1929 to 1933. This cultivated intellectual and linguist was the only First Lady who was proficient in speaking Chinese. 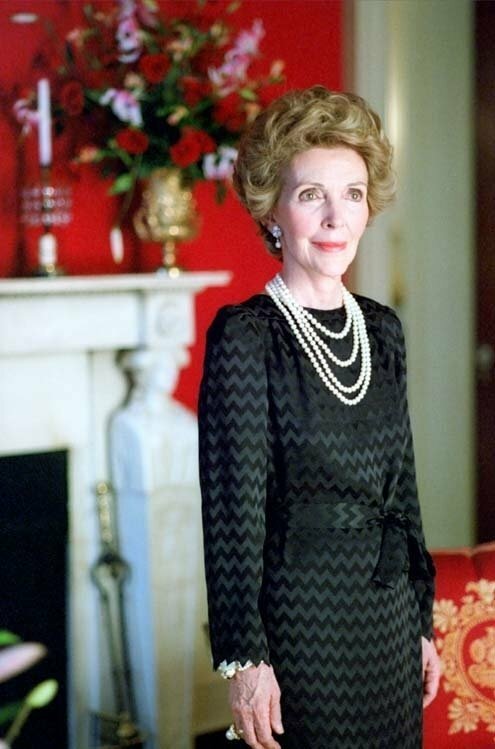 She is shown in her official White House portrait, wearing a gorgeous gold and pearl necklace. 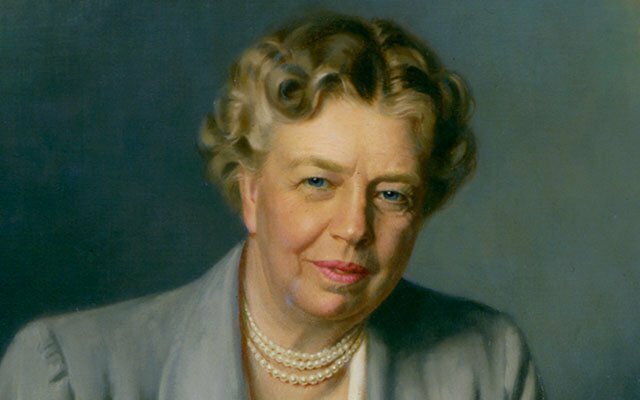 Eleanor Roosevelt is one of the most beloved First Ladies of the 20th century. She was a widely respected public speaker, diplomat, politician, and activist. She is shown here wearing a triple strand pearl necklace. 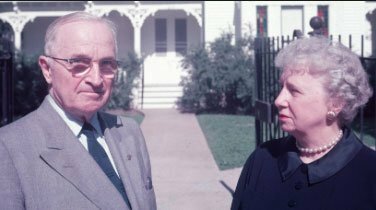 Bess Truman, wife of Harry S. Truman, served as First Lady from 1945 to 1953. She was a woman of simple tastes and did not enjoy the social obligations which came along with her position. In most of her official photographs and portraits, Bess is seen wearing an understated, but elegant, single strand of pearls. 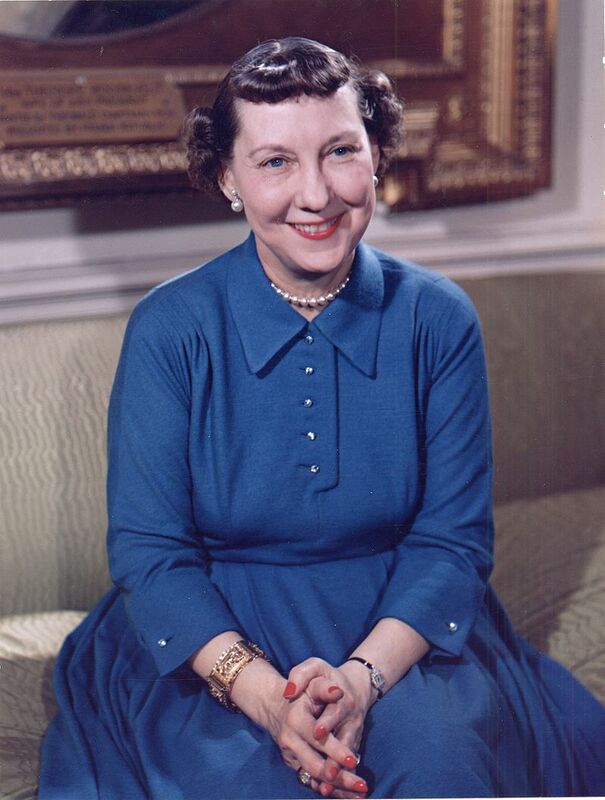 Mamie Eisenhower and her husband Dwight D. Eisenhower entertained an unrivaled amount of guests and heads of state while living in the White House. The “Mamie Look,” her contribution to fashion, consisted of wearing a full-skirted dress, little hats, bobbed hair with bangs, and a pearl, or rhinestone and pearl necklace. Jacqueline Kennedy, the wife of John F. Kennedy, was known as a fashion icon from the instant she stepped into the White House. Here she is pictured wearing a beautiful double strand pearl necklace. 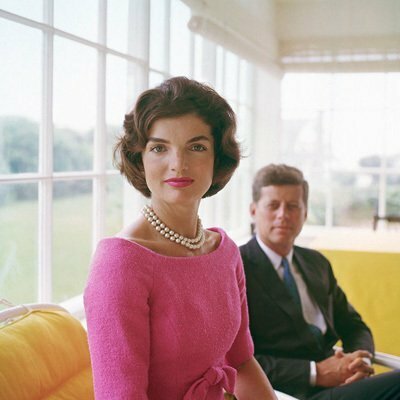 She also owned a magnificent faux triple-strand pearl necklace, made of Czechoslovakia glass pearls, which was Jackie’s signature piece. It sold at auction for $211,500 in 1996. 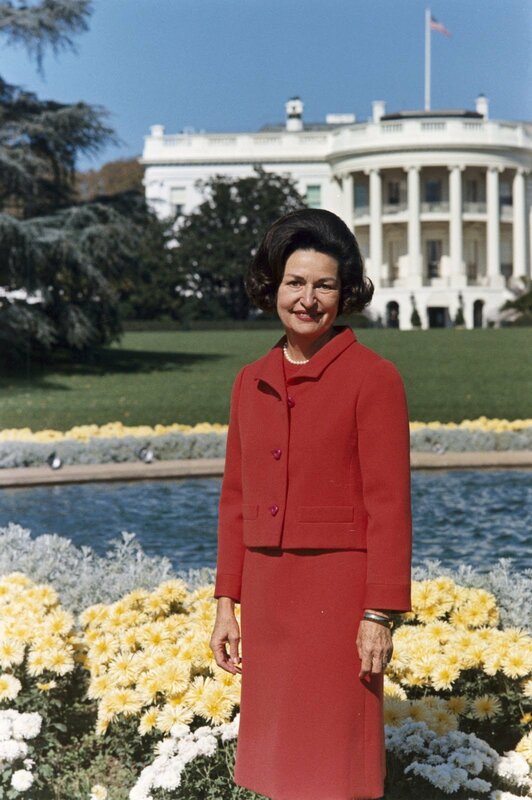 Claudia Johnson, known as Ladybird, was the wife of Lyndon B. Johnson and served as First Lady from 1963 to 1969. Many photographs of her exist wearing one, two, or three strands of pearls. Thelma, known as Pat Nixon, was married to Richard Nixon and served as our First Lady from 1969 to 1974. She promoted many charitable causes, including volunteerism, and was frequently photographed wearing lovely strands of pearls. Elizabeth Ford was a very outspoken First Lady, commenting on everything from equal pay and feminism, to gun control and abortion. 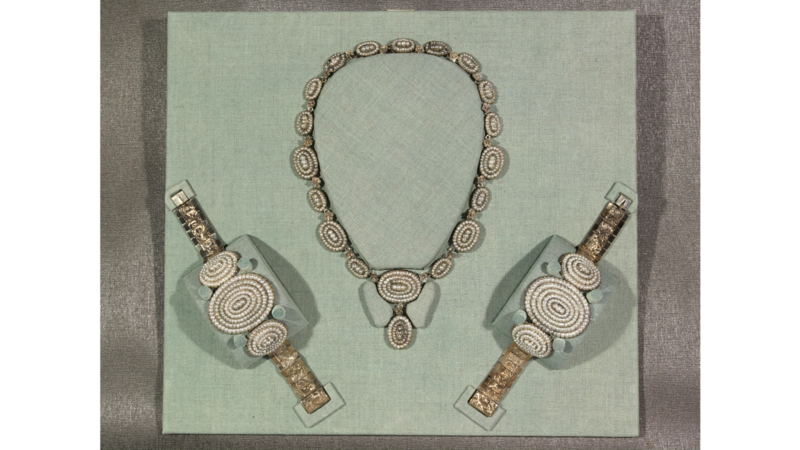 Her taste in jewelry was understated elegance, frequently wearing a pearl necklace and matching earrings. 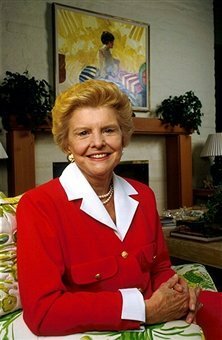 Betty Ford was a lifelong advocate of the arts. The Parsons New School for Design gave her an award in recognition of her style, which often involved wearing simple pearl earrings. 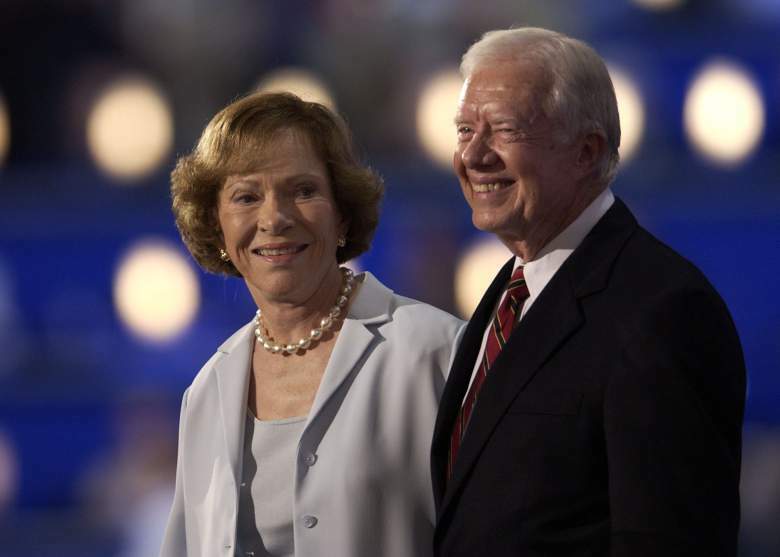 Eleanor (Rosalynn) Carter was married to Jimmy Carter and served as First Lady from 1977 to 1981. Pearl necklaces are a favorite of hers. Nancy Reagan was a Hollywood star who would go on to marry Ronald Reagan and become our First Lady. She adored pearls and would wear them frequently. 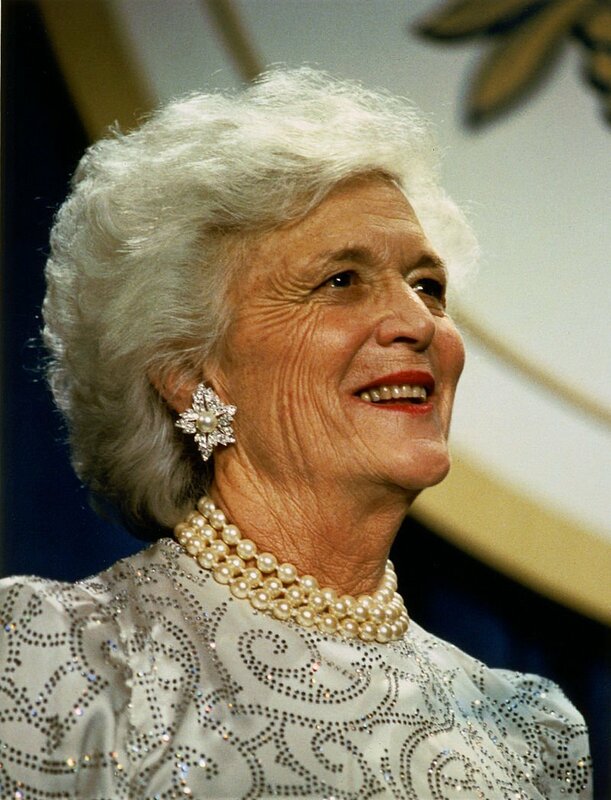 Barbara Bush, wife of George H. W. Bush, served as our First Lady from 1989 to 1993. An unaffected, no-nonsense type of woman, Barbara’s signature double and triple strand of faux pearls were created by KJL (Kenneth Jay Lane) and sold for approximately $95. 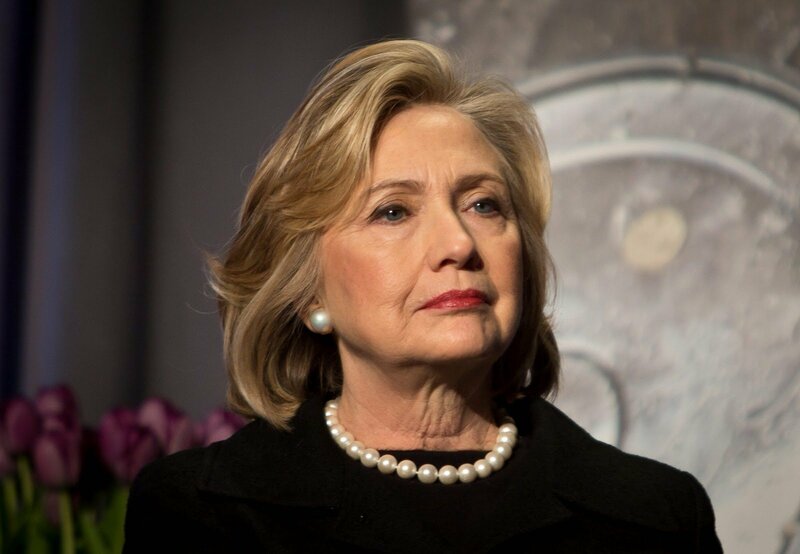 Hillary Clinton was married to Bill Clinton in 1975 and served as our First Lady from 1993 to 2001. Her pearl necklaces and earrings are a very popular and elegant part of her wardrobe. 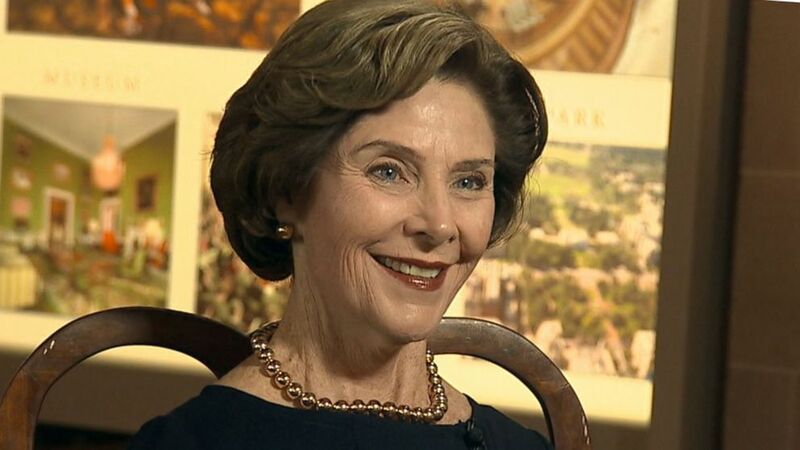 Laura Bush is married to George W. Bush and served as First Lady from 2001 to 2009. She frequently wears an exquisite strand of pearls, accompanied by beautiful pearl earrings. Laura Bush has a soft spot for pearls. The lustrous beads never lose their place on the fashion scene and are worn both short and ladylike, and long and layered by Laura. 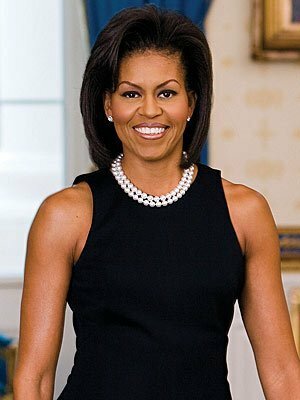 Michelle Obama is married to Barack Obama and has been our First Lady since 2008. She also adores pearls. One of her stylish looks is a combination Swarovski crystal and freshwater pearl necklace that fairly pops with glamorous and chic beauty. She loves them small, chunky, short, long, multi-strand, and single strand, just like the necklace is shown in her official White House photo above. Research by Kristen Markovich at Gulfstream Jewels in Miami, FL. Gulfstream Jewels is owned by industry veteran Mitchell J. Swerdlow, and this business buys, sells, appraises, and consigns fine jewelry throughout the South Florida area. You know that Martha Washington wasn’t wearing pearls in 1879, right? She’d been dead a long, long time by then. 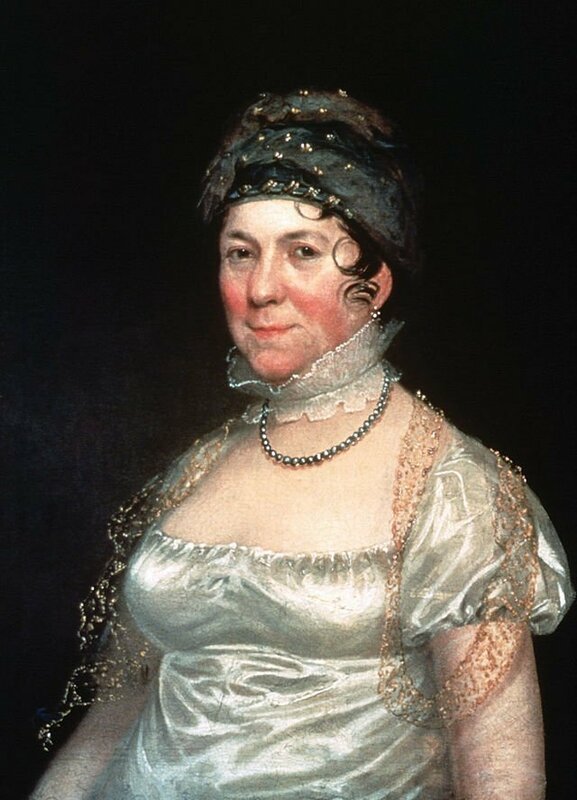 Plus you may want to take another look at Dolley’s “simple” pearl necklace – those are SALT WATER pearls, and they’re BLACK. She’s wearing a FORTUNE around her neck!